A new way to easily locate minerals and resources in Minecraft. 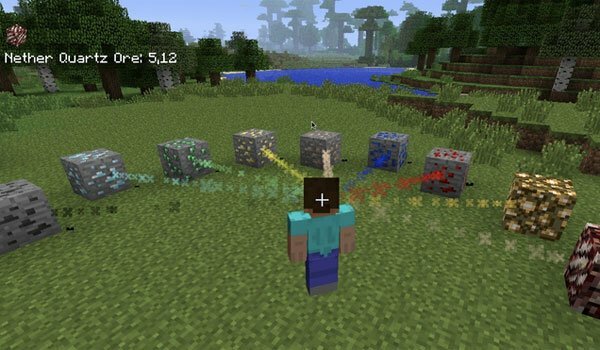 Scenter 1.7.2 and 1.7.10 is a mod uses a particle beam to let us know where is any mineral that its nearby, so once this beam appears, follow it to end, reaching the mineral block in order to remove it. The mod does a search in the vicinity of our character each time we interact with the environment, heach time you right or lef click, the mod informs you if you have resources nearby. Key “O” to activate Scenter, key twice and you will get to the personalization menu where you can select which minerals you want the mod to detect, as well as, the particle beam color. To deactivate key “L”. How to install Scenter Mod for Minecraft 1.7.2 and 1.7.10? Scaner resources and minerals in Minecraft!